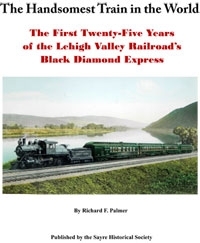 This 42-page book with a soft cover contain numerous photos, data and descriptive information, including personal accounts, about the "glory days" of the famous Black Diamond train. Excellent photos of the lavish interior of the passenger areas. Price-$9.43+.057 tax. Total 10.00 plus $3.00 shipping and handling.